William Morris Hughes was born on 25 September 1862 in London, the only child of Welsh parents William and Jane Hughes. Following his mother’s death when he was seven, Hughes went to live with her family in Wales where he attended the local grammar school until the age of twelve. Returning to London, he completed a five-year apprenticeship as a pupil teacher at St Stephen's Anglican School in Westminster and was later employed as an assistant teacher. At the age of twenty-two, Hughes relocated to Australia as an assisted migrant, arriving in Brisbane in December 1884. Finding no teaching positions available, he travelled outside the city, taking on a variety of jobs including farm labourer, blacksmith's striker, tally clerk, and well sinker. After moving to Sydney in 1886, Hughes found work as an oven-maker’s assistant and took up his first permanent residence in an inner city boarding-house. Later that year, he married his landlady’s daughter, Elizabeth Cutts, and in 1889 the couple had the first of their six children, Ethel. In an effort to boost the population, the assisted migrant scheme funded the passage of British citizens to Australia. In 1890, the family moved to the harbourside suburb Balmain, where Hughes found himself surrounded by the struggles of the working class. As an informal advisor to the Wharf Labourers' Union, he became actively involved in the maritime strike and rallied support for a range of causes through his fiery street corner speeches. The following year he and Elizabeth opened a small business in their home that, along with general household goods, sold books and political pamphlets. The back room became an important meeting place for local reformers, with lively discussions leading to the establishment of the Labor Electoral League in 1891 and the Socialist League in 1892. When Hughes won the election he was raced through the city in a dog-cart by his supporters. 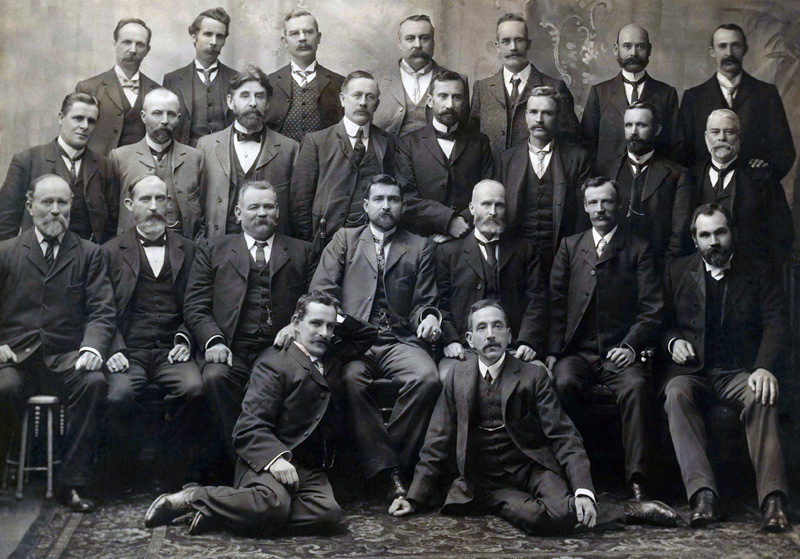 In 1894, Hughes put his negotiating skills to great use as the regional organiser for the Amalgamated Shearers' Union, signing up new members across western NSW and establishing the first Labor Electoral Leagues. As the Solidarity Labor Party candidate, Hughes was elected to the New South Wales Legislative Assembly on 17 July 1894. Members of the Australian Labor Party elected to the first federal parliament. Hughes is seated on the floor (front right). Although initially sceptical about Australia’s federation, Hughes later became a leading advocate for a federal government, declaring his strong views on immigration, defence and working conditions. In the first Australian election held on 29 March 1901, Hughes was elected Labor candidate for West Sydney. In Labor’s first elected government, Hughes was appointed Minister of External Affairs. Although this was a short-lived victory, he gained important political and administrative experience that he would come to depend on in years to come. In the Labor victory of 1908, Prime Minister Andrew Fisher appointed Hughes to the role of Attorney-General. He held this position for the next three Labor governments and from 1910-1915 also served as Fisher’s Deputy Prime Minister. With the outbreak of war in 1914, both parties proclaimed their support for Britain in a fierce election campaign that resulted in a clear win for Labor. Following Fisher’s resignation from office in October 1915, Hughes was unanimously voted in as Prime Minister. The first Labor government was led by Prime Minister John Watson and lasted only 4 months. The following year, Hughes travelled to England where he held important talks with politicians and military officials and made a strong impression on the public with his lively and persuasive public speeches. 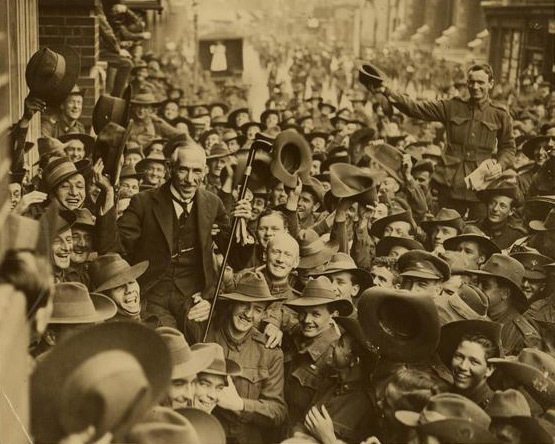 After visiting Australian troops on the Western Front, Hughes returned to Australia with the clear aim of increasing support through the introduction of conscription. Without the backing required to pass new legislation through parliament, Hughes took his case to the Australian people through a referendum. Hughes opened the 'Yes' campaign for conscription on 18 September 1916. He fought desperately to convince the public that this was the right decision, but lost the final ballot by a small majority. For his advocacy of conscription, Hughes was expelled from the Labor Party. Hughes was reinstated by the Governor General when no replacement was found. In order to maintain a majority in parliament, Hughes was forced to merge with the Opposition in a 'Win the War' Party. In the election of May 1917, they won a sweeping victory, and although Hughes had made an election promise not to reopen the conscription debate, he announced another referendum for 20 December 1917. This time, the result was an even more resounding ‘No’ and Hughes, who had declared he would not govern without conscription, briefly resigned as Prime Minister. On shaky political ground, Hughes travelled to England to attend the meeting of the Imperial War Cabinet. He was still in England when the armistice was signed on 11 November 1918. Hughes returned to a hero's welcome from the post-war peace conferences in the persona of 'Billy' Hughes, the 'Little Digger'. He remained Prime Minister up until 1923 but his political base was far from stable. Over the course of the next thirty years he was expelled from both the National and United Australia Parties, and ended his days in politics in a Liberal seat. A few days after his 90th birthday, Hughes suffered a severe bout of pneumonia and died at his home on 28 October 1952. He was honoured by a state funeral at St Andrew's Anglican Cathedral in Sydney.